The first ‘Fluffy-Noir’ anthology Graphic Novel. Ruxby Bear and Toyburg PD investigate cases of violence, corruption and murder in a city of toys. 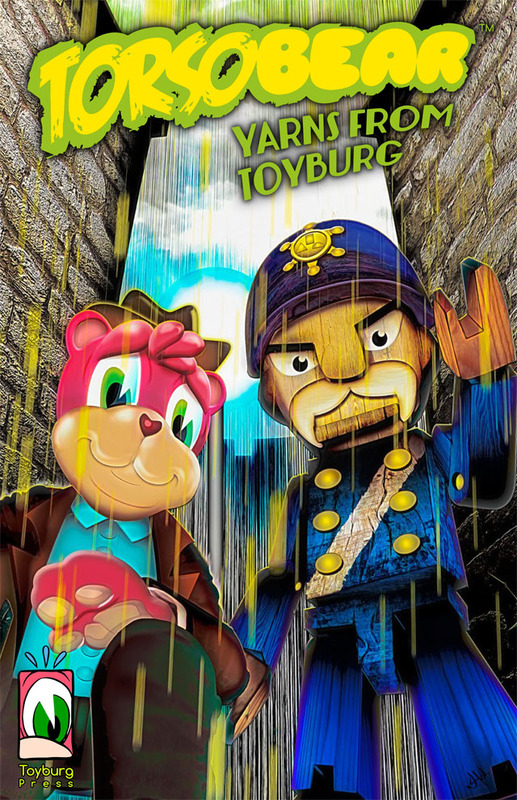 Torsobear: Yarns from Toyburg is the first volume of a cartoon noir comic book, about toy-on-toy crime in a fantastic city of playthings, created by Brett Uren. Anybody who loves cute toys and cartoons, new and old will love the twelve stories contained within. But be warned, these yarns ain’t for the faint of fluff! The stories were created by Brett Uren (Kuzimu, The Vale), Cy Dethan (Cancertown, Indifference Engine), Brockton McKinney (Ehmm Theory, Deathcurse), Janos Honkonen (Kaiken yll&auml; etana, The Rocket Man from the Sea), co-editor Glenn Moane (Fubar, Indie Comics Horror), Grainne McEntee (Apes ‘n’ Capes), Jon Scrivens (Little Terrors), Kieran Squires, Frank Martin & Jake Young. The artists include: Peter Mason (Cancertown Blasphemous Tumours), Saoirse Louise Towler (Discworld Stamps), Jon Scrivens, Randy Haldeman (The Jacket), Matt Rooke (Apes ‘n’ Capes), Giles Crawford (Lowlives), Carlos Zamuido (The Remains) & the almighty Hal Laren (Reaper Comics).